Enter G.Skill. G.Skill has a rep for being where there in the middle of the overclocking world. They hold quite a few world records when it comes to bandwidth numbers. But for those that will not be putting LN2 to your system G.Skill has made it easy for us common folk to obtain some high frequencies. For a mere $99, you can get 8GB of ram that will give you 2400 MHz with a simple selection in the BIOS of a good Z77 based motherboard. Their new kit is under the Trident X series and offers more than bandwidth. With the introduction of the Intel Z77 came the introduction to a whole new level of memory and memory overclocking. When the P67 and Z68 showed up we were amazing to see 2133 MHz listed under the memory frequency in the BIOS. But with the Z77 and the improved integrated memory controller of the Ivy Bridge processors it is commonplace to see 2400 MHz, 2666 MHz and even 2800 MHz listed. But until recently we are starting to see ram kits come to market capable of these frequencies. And the few that were available were so grossly over-priced. The Trident X series begins with the 2400 MHz modules and goes up to the impressive 2800 MHz. We were amazing at 2400 MHz but dang just imagine 2800 MHz. The 2400 line-up kits ranging from dual 8 GB to quad 32GB. The modules sizes are 2 GB, 4 GB and 8GB. The other two also consist of the same kits and modules. But what is even more impressive is that G.Skill didn’t have to go soft on the timings with these2400 MHz kits. The timings remain at a very respectable 10-12-12-31 at 1.65v using Intel’s XMP profiling. They are also rated for operation at 1600 MHz at just 1.5v. With the aid of the XMP features the memory will run at its preset setting without having to overclock the CPU. The new Trident X series brings in a new set of heat spreaders pretty different from the original Trident modules. These are relatively tall in their packaged state but not at tall as say the Corsair Dominators and other kits but close. The colors of the modules are a mixture of metallic red and black. 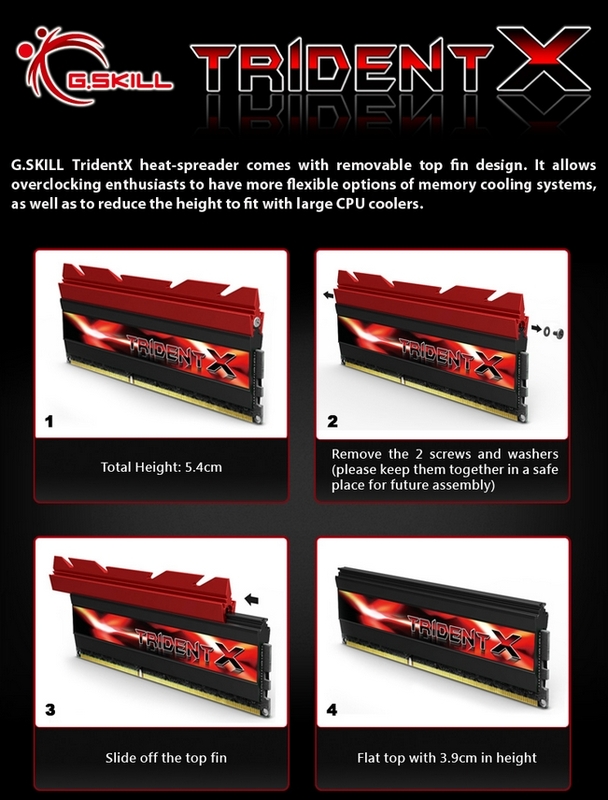 One side of the modules gives us the G.Skill and Trident X logos. While flipping to the opposite side give you once again the Trident X logo with the product sticker. The sticker gives you basic information about the modules like name, speed and timings. What is really different about these modules is the modular top. Yes, the red upper fin of the head spreader is detachable from the rest of the stick. This eliminates the heat spreaders from being the heart of the dilemma when trying to fit on some of the larger heat sinks. There are just two screws and two washers that keep the modules intact. Removing these will allow the fin to slide off to one end of the module. In our case I just who ever screwed these on did it too tight and pretty much destroyed the washers. With the small pieces remained we were able to secure the fins back on with any problem. The overclocking process within the Z77 is slightly different from the X79 we have been playing with as of late. We do not have the aid of the CPU Strap to get higher frequencies. It is up to the preset memory frequencies in the BIOS and the little play you have in the BCLK of the CPU. And with that being said we went straight to the 2666 MHz setting with no luck. The system refused to boot at all with the voltage remaining at 1.65v. So, we were forced to start our overclocking adventure at the default 2400 MHz and use the BCLK to up the memory frequency. After all said and done we netted 2520 MHz with the default timings. Next the real challenge lowering the timing to something a little more tightly. We chose CAS 9 as a nice goal. At 9-11-10-30, we were able to get to 2288 MHz before the system was deemed unstable. Once again we were using the default voltage of 1.65v. Loosen the timings but keeping the same voltage resulted in 2590 MHz at 11-13-13-31. The most exciting feature about the Trident X series of memory is the three very high frequencies they come in which are 2400, 2666 and 2800 MHz. these are insane by yesterday’s standard and pretty impressive by today’s standard. The integrated memory controller of the new Ivy Bridge processors make all this possible but companies likes G.Skill actually put it in our hands. The modular fins of the Trident X are a cool little feature. It gives the user who has clearance restrictions the opportunity to also take advantage of the high frequencies of the kit. But using them when you can does allow some extra cooling to the modules when upping the volts for more overclocking. And speaking of overclocking we did not think the kit would have much headroom when it came down to it. And to respond to this is hard. The jump in preset frequencies in the BIOS of most Z77 motherboards go from 2400 to 2666 MHz. this is quite a big jump for memory that is already clocked high. And it isn’t like we have the CPU Strap to play with like the X79 chipset. So, we are left with the CPU BCLK which has a low ceiling. At the default settings we were able to muster 2520 MHz from the kit. But I am sure there is more left but without a CPU with a high BCLK we will never know. This particular kit will cost you about $99. This is more expensive than most kits on the market but most kits on the market is not clocked at 2400 MHz. so, I am buy in on this kit.